Just go ahead and just laugh. I can take it. This is SUCH a weird looking recipe. I almost didn’t share it because I was too, um, shy. I mean, shy about how it looks. As I blissfully ate every last bite from the big bowl sitting on my lap on the couch in front of the TV (<— we have a personal rule against that, but we do it sometimes anyways and it’s just the most cozy-nice thing), I started to realize that, in fact, the shapes and colors and general vibe of this whole dish just says Weirdo Person. And I started to second guess that anyone else is the world was going to give this even one second of their eyeballs. Sad face. But the great thing about a blog is that even if everyone thinks you’re a little cray cray, slash even if you ARE a little cray-cray, you ultimately have the blog as an expression of yourself, by yourself, for yourself, reflecting yourself. So let me express myself and my current FOOD LOVE through this green-blobby-blob that might just be my favorite recipe of 2014. no seeeeriously. So unrelated to the food, I have a confession to make. I’m really tired. Amen! said the whole world. Unless one of you is harboring some secret super person energy, in which case please consult with me immediately. We had talked a little bit earlier this year about peace and rest and burnout and all those nice things that go along with the B word: balance. Right now I feel like I am trying so hard to have peace that the trying to have peace is making me not have peace. And it’s also making me write like a maniac. So I’m a food weirdo and a writing maniac. Who.what.why.how.omg. Make it stop. The good thing is that I love everything that I do for work and I want to do more of all of it, minus anything involving an alarm clock. But other than that. I feel like I need 900 million hours in every day in order to do all the things I love. I can’t even keep up with myself right now and my food ideas and my students taking their big dramatic and important state tests and my ecookbook being almost done and our house and the boxes of un-put-together furniture downstairs and then a recipe like this comes along and slooooooows meeeee dooooown. Yes. Sloooow. Like the nice, relaxing kind that makes you take a few long breaths. After a long day at job 1 and another long day at job 2, tonight I ate a big warm bowl of this, alone, on the couch, while watching a low-budget cooking show and wearing my pajamas at 7pm. It was my favorite kind of food in my favorite kind of relaxed happy place. This recipe speaks to my love of all things comforting/comfortable. The texture and saucy wonderfulness all piled up high together on a plate just makes my heart smile. The poblano mushrooms are spicy, warm, dreamy. You’re going to be roasting them and you’re going to be happy you did. They are the base of this flavor-rocking sauce that goes over the sauteed garlic butter mushrooms and over a scoop of semi-firm, chewy, and buttery polenta. Weirdly awesome food to the rescue, and just in time for the weekend. Holla back yo. This recipe for Creamy Poblano Mushrooms with Polenta is a simple vegetarian dish with tons of flavor! Simple and delicious! Sauce: Roast the poblano peppers over an open flame or in the oven until the outside is slightly charred. Place under a towel for a few minutes to steam and soften. Cut into pieces and set aside. Puree the sour cream, water, oil, garlic, and salt in a food process. Add the green onions and poblano peppers and puree until desired consistency is reached. I like to leave a little bit of texture in the sauce. Polenta: Bring 4 cups of water to boil. Add the cornmeal and salt; simmer until thick and bubbly, about 5-10 minutes, keeping in mind that the polenta firms up quite a bit as it cools. Add 1 tablespoon butter once removed from heat. Mushrooms: Melt 1 tablespoon butter in a large skillet over high heat. Add the garlic and the mushrooms; saute until golden brown. Add the sauce and the cornstarch dissolved in water. Bring to a simmer until the sauce is slightly thickened. Serve the mushrooms and sauce over the polenta. The funny thing is that the weirdest looking recipes are usually the best! I don’t know what it is, but the weirdness magically disappears sometime from fork –> mouth! Taylor, you will LOVE polenta. I make it so it’s still creamy, almost like mashed potatoes, and it’s just divine. Three ingredient perfection. I had to laugh when I read this, because I was struggling with the same thing for one of my posts last night. But after reading this, it’s going on the blog!!! Because you make a great point, these are food blogs and if it tastes awesome, it’s worth posting!!! You did so amazing with these photos. I think I would a keeled over and cried dealing with this dish. Ha!! 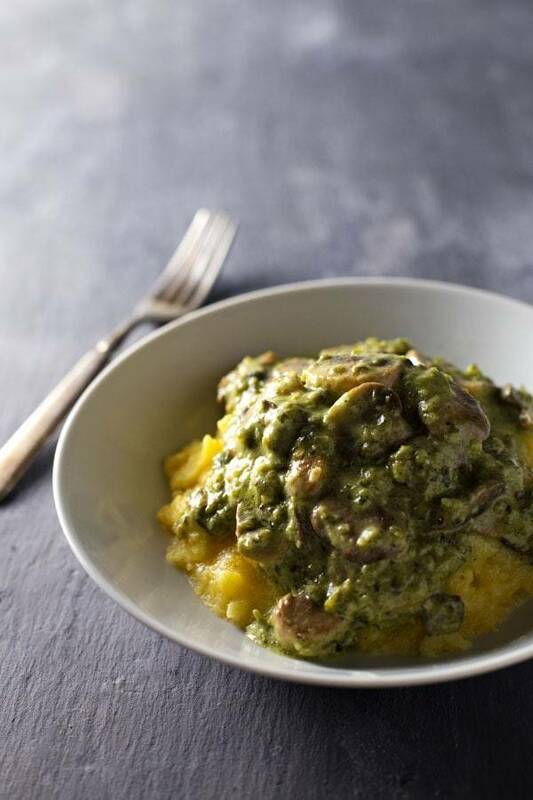 But really, I LOVE polenta and that poblano mushroom sauce sounds amazing! This sounds wonderful! Love all of those flavors! Thanks Ali! Have a great weekend! Ah, polenta. You make all the things right. You could put just about anything over polenta and I’d be happy about it. Happy Friday you guys! DEEP BREATH. Ahhhhh. That felt good. I have been much the same way here (um, who was or was not up until 2 am last night, ugh.) Thanks for remind me that it’s OK to take a step back, break a few rules, and dive head long into some comfort food. And I’m totally on board with this. Glad you posted it! 2 am! Girl. 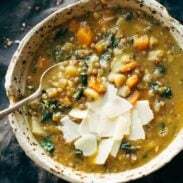 I am virtually sending you a bowl of this so you can cozy up tonight. TGIF! This looks DEEE- VINE!!! Added to my ziplist. :) LOVE anything mushroom here!!! Baked your fudgy chocolate chocolate chip cookies the other day and might I say, “Yummy yum yum right out of the oven!! !” Thank you! Thanks Melissa! Always excited to find other mushroom lovers. 🙂 And glad you liked the cookies! Oh Lindsay, I can so relate to not having enough time for all the things that you LOVE to do!! There just isn’t enough time in the day. And then, add wanting to make about 90% of all the food posts you read and it really gets crazy! Ha! I grew up eating polenta and I just loooove it. Yours looks delish!! I wish I would have grown up eating it. It’s one of my new favorite foods! Never tried polenta, but I feel that I need to give it a shot. Sometimes I daydream about how nice it would be to go to a coffeeshop, sit with my laptop, and work on my blog all day uninterrupted. Then I come back to reality. I’m trying to treat my blog like a business/job, but some weeks it’s really hard. It IS all about the sauce. My life is all about the sauce. Sauce!! I think part of this whole balance thing we’re all striving for is relishing that slow time where you can and just allowing yourself to be in the moment. Unfortunately, when you have a zillion and one things on your plate, that can be the hardest part! This recipe combines so many of my favorites and I love that you used sour cream instead of something heavier. I can’t wait to try this!!! Some of the best, most delicious food is decidedly un-photogenic. And who cares, because if it’s delicious, that’s the only thing that REALLY matters. 🙂 This sounds great – it’s really unusual, but I think I would still give it a try! I’m curious/nosy: what are some of your favorite cooking shows to watch??? Well, I love to watch Food Network shows but we don’t have cable. But if I get the chance, I like The Neely’s, Giada, and Ellie Krieger, to name a few. 🙂 Also love Diners Drive Ins and Dives. Ohhh man. Looks like deliciousness! And that sitting in front of the couch with a big bowl of this sounds like just the speed that is needed right now. To me this looks so good I would lock myself in my room with a bowl of this and eat it all myself. So I don’t have to share. Yum! I’m right there with you on the peace and balance thing. I haven’t been so good about balancing my sleep and work life, and I had a major wake-up call (or lack thereof) this morning when it was cloudy and raining. Normally the sun streams in through the window and turns our bedroom into a sauna, which immediately wakes me up, but without any sunshine today, my body told me it desperately wanted sleep and didn’t wake itself up until almost noon. Noon! And I’m a morning person! And now I’ve been on the couch in a comfy cozy sweatshirt all day taking it easy, and a big bowl of comfort food is exactly what my trying-not-to-get-sick-from-lack-of-sleep body needs. If only I wasn’t allergic to mushrooms — the pepper and polenta part sounds so good! YES to the comfy cozy sweatshirt and the couch! Sorry about your allergy – bleh! That’s a bummer. Meals like this make me smile so hard. LOVE! Thanks Heather! 🙂 Nice to have readers who appreciate it. Weird food can be the best! I’m so glad you shared this because it sounds absolutely delicious! What a great combo of flavors! Hope you are having a restful and relaxing weekend – life can be so exhausting! Does anyone have suggestions to replace the Poblano peppers? You can’t get them in the UK without paying “import” prices. In terms of fresh, I can get sweet red peppers, regular bell peppers (red yellow green) and big long romano peppers. There’s also tinned/jarred jalapenos. I’ll probably roast some bell peppers!